Trimley is a western suburb of Felixstowe, a low drama of modern housing stretched along the former A45. It is still dignified by two parish names (there used to be three, but Alston, also known as Trimley St John, was subsumed by the others some 400 years ago). The churches of St Martin and St Mary sit in the same graveyard. Coming here ten years ago, I mused on the reasons why such a busy place might not have a very big congregation in its Anglican parish church. I observed that one might imagine St Martin a thriving community, but the situation here had proved rather curious. Felixstowe itself has five parish churches, including the Suffolk Anglo-catholic flagship of St John the Baptist, and what was then the famously and militantly protestant St Andrew. There is also the vast edifice of Cavendish Community Church, now renamed Christ Church the county's biggest evangelical project. Adjacent Walton has another church of evangelical tendencies, and Trimley itself has several other churches, including the lively Catholic church of St Cecilia, and the popular Trimley Free Church. So, you begin to feel the squeeze. 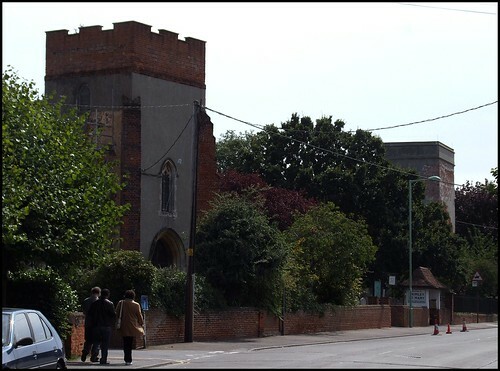 It was inevitable that at least one of the Trimley churches would become redundant, but in the end this did not happen, the joint parish prefering to successfully reinvent St Mary as a community facility, St Martin remaining as the parish church. St Martin is one of several churches in this immediate area dedicated to the former Bishop of Tours. Across the graveyard, St Mary is now a multi-purpose building; the two buildings are not dissimilar, although St Martin was obviously ahead in the queue when the towers were handed out. St Martin is more apparently 19th century than its partner, although in fact very little remains of either building that is openly medieval. Something that both churches have in common is that they are both ordinarily kept locked without a keyholder notice. Back in 1999, my reason for musing on the parish life of Trimley was that the interior of St Martin had been reordered, with modern chairs turned in an arc to face an altar set against the south wall beneath a rather alarming war memorial window. At the time, the churchwarden had explained to me that it was cosier this way. "There aren't very many of us, I'm afraid", she'd observed sadly. Coming back here in 2008, I had a rather curious experience at the next door church of St Mary, which you can read about there, but it resulted in us being allowed to see inside St Martin as well. What a change there had been, for the integrity of the interior had been restored, with the chairs turned to face the sanctuary in the east. The new churchwarden told us that the parish was now so busy that this was the only way of fitting everyone in, which was heartwarming to hear. As with St Mary, this church is notable for its late 19th and early 20th Century glass, and although it isn't quite as good as that in the church next door, The best of all is here in the north aisle, the former Cavendish chantry, and depicts a highly original and inventive Resurrection scene. Sam Mortlock tells me that he has been unable to identify the artist, although the signature appears to be CAH, and it probably dates from the 1940s. Trimely's most famous window depicts Christ as a crucified king attended by an airman, a sailor and a soldier, and forms the parish's World War Two memorial. I think it is rather bizzare, I must say, but it is the stuff out of which postcards are made, or were, in the days when people still sent and collected them. The workshop was the splendidly named Hendra & Harper of Harpenden, and the Hs of their signature are set into the foot of the window. All in all, an interior well worth seeing. But if you can't get inside, there is a super collection of 17th and 18th century gravestones in the churchyard outside.